Taking time to appreciate the journey…. I had a knot in my stomach as I walked into the hospital, and looked around for the room where my mom was having her chemotherapy treatments. I was planning to sit with her for the last two hours, just a portion of the time she had to sit there being injected with drugs that would hopefully ensure that no more cancer would spread through her body. 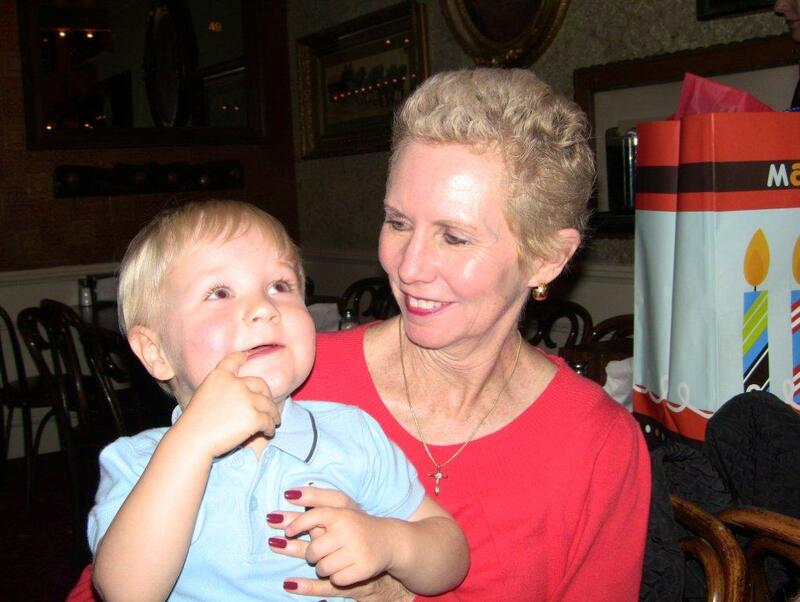 I remember the day in 2009 when my dad called me to tell me that they had discovered my mom had breast cancer…again. I remember the music playing in the background as my son was watching his Baby Einstein video. Even today, when I hear that music I develop a slight lump in my throat. I have to admit – the news that she was facing breast cancer for a second time was devastating and scary. She was only 32 when she received her first diagnosis of breast cancer, and endured several surgeries to ensure it was gone. Her mother (my grandmother) died of breast cancer when my mom was 24 and pregnant with my younger brother; I was almost 2. Her father (my grandfather) died of brain cancer when I was 16. Haven’t we already had enough cancer in this family? And why would my mom have it again 28 years later? I was angry and scared. I was only 8 years old when my mom had her first bout with cancer. That is a very terrifying word for a child. And it was scary to watch the adults around me fall apart at the news…. my dad, my grandfather, and my parents’ friends. But back then, it truly was alarming as breast cancer was not as easily detected or treated, like it is today. The day I went to sit with my mom for one of her last chemo treatments, I came in feeling sad, but I left feeling proud of my mom. I had already been proud of her for being so positive and encouraging to us. I had been proud of her for memorizing Psalm 91, and quoting it when she felt uneasy. But I was most proud of her for an act of love that is embedded in my memory. After her treatment was completed for that day, she, my dad, and I started walking down a hallway leading to the parking garage. There was a lady standing in the hallway, quietly crying as she faced the wall. She wore a red wig. I remembered seeing her earlier as she talked with a nurse and filled out paperwork. She had been disappointed when the nurse told her how long she needed to be there that day. “How am I supposed to handle my job too? I have to get back to work today”. And so a bit later we saw her out in the hall crying. As we walked past her, my dad and I both looked at my mom. “Maybe you should talk to her”, my dad said. So my mom did. From a distance my dad and I waited, but saw them talking, and my mom hugged her and told her, “it gets easier”. My mother literally stepped out of her own pain and difficult circumstances to encourage someone else. And because she chose to do that, I believe the woman found a much-needed glimpse of hope that day. If my mom had not displayed such trust in God, and had not reached out to so many people during her own trial, I think I would have remained scared during the whole ordeal. 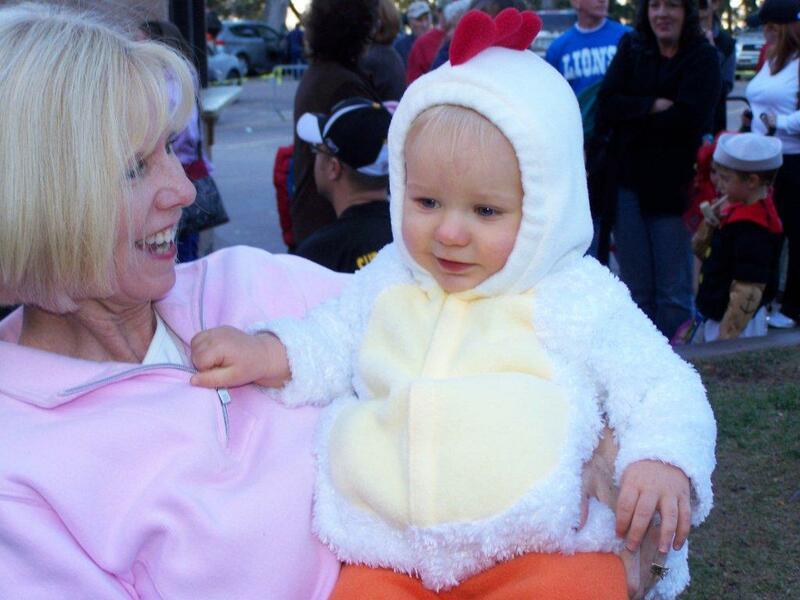 She endured surgery, radiation, and chemo….and she somehow found the strength to laugh, love, and encourage other people. And so she gave me the gift of hope in the face of the unknown. I think it’s safe to say that how we handle a difficult journey and the attitude we choose while going through it will have an impact on how those around us will handle it. I pray I can be that same example to my boys when we face future heartbreaks, which are just inevitable in life. Thank you mom! I love you. Categories: Inspiration, Journey With God, Relationships | Tags: Awareness, Baby Einstein, Base on balls, Breast, Breast cancer, Cancer, Conditions and Diseases, Health | Permalink. 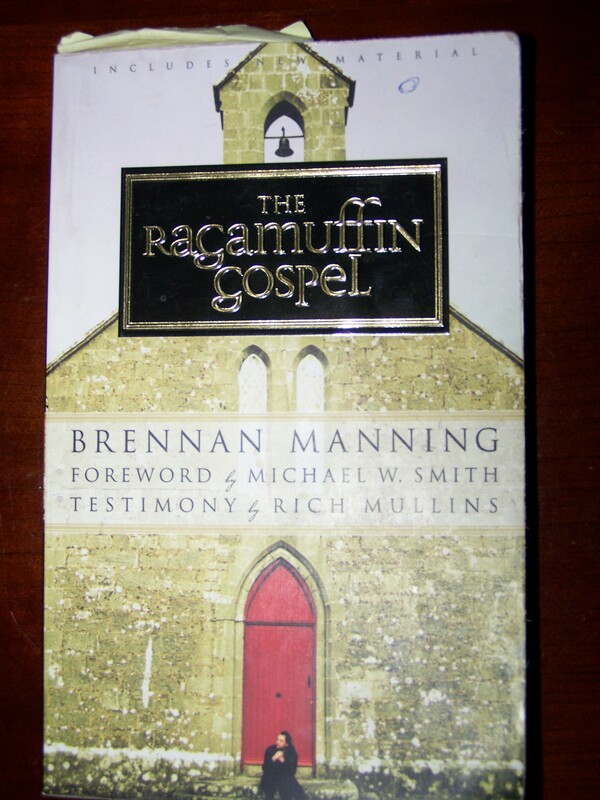 The Ragamuffin Gospel, by Brennan Manning…… I’ve read it twice, each time taking a ridiculous amount of time. The words filling each page are so well crafted and piercing. They are the words of a man that had a connection with God that I can only imagine, but long for. I guess that’s why I have to take the time to patiently study his writing in order to really grasp it. 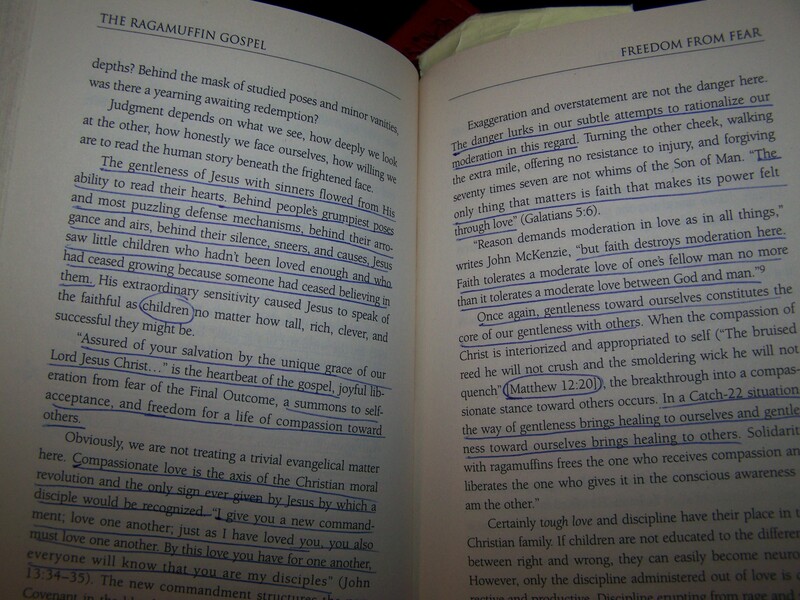 But perhaps reading the Ragamuffin Gospel took me so long because I underlined almost every sentence. After hearing about Brennan Manning’s death, I pulled out my worn out Ragamuffin Gospel book just to reflect once again on how much the truths in his book have spoken to me. I came to the page shown above and studied it for a while. I thought back to when this book meant so much to me. I can remember where I was while reading it, and what was going through my mind during that season of life. It’s one of my treasured books that I would never give away to Goodwill…and I’ve kept it in a certain spot so I would remember to read it a third time. Perhaps that time is now, because as much as I would like to say I understand authentic grace, the reality is I still struggle. I have trouble accepting it and I have trouble giving it. As I went over my underlined passages again, I realized that most of them are about learning to embrace His grace and love…a familiar feeling today. It starts with our acceptance, but it must also be given away. That’s the gift of grace. Recently I was humbled and brought to tears as I thought of a difficult forgiveness journey. I thought of the words I have heard so many times when people discuss forgiveness: “We need to forgive for us so that we do not carry a burden and become bitter”. What about forgiving for them? What if our efforts were spent offering the same gifts we ourselves have received in an effort for someone else to see God…and see themselves as loved and accepted by Him. What if it was about them and not us? May I believe in them. Categories: Inspiration, Journey With God, Relationships | Tags: Christianity, God, Jesus | Permalink. “Mama, I just want to play with you”. Believe me – I hear that statement about 15 times a day. And the other day, in particular was a rough day. You know…the kind when both kids are taking turns crying, or crying at the same time all….day….long. And like most days lately, I thought I had broken my record for the amount of times I’d said “no” in one day. And while I was trying to find yet another thing he could play with so I could take my 5-minute “wash only the important parts” shower, he stopped me in my tracks. “Mama, I just want to play with you”. There was a soft tone, his eyes meeting mine, and I really saw him. I didn’t see the “whiney” child who will not obey, or the older brother who knows not to take things away from his younger brother…I saw his sincere need. I prolonged my shower again and sat down to play with my son for a few minutes, but with a calm demeanor and a genuine desire. Just a few positive moments with his mama was all he needed. And I needed it even more. His sincerity brought a unique restoration that our relationship was in need of. Twice in the past few weeks I have sat across the table at coffee shops from someone I dearly loved as we approached a delicate conversation. In each situation both of us listened and received what the other person had to say. And each of us felt heard. We processed, rather than blamed. We saw it as an opportunity to grow as individuals. And we put the person above the issue. Each situation was different, but one thing was the same – we each chose sincerity. Now doesn’t that sound nice and simple? Well I can’t tell you how much frustration, hurt and confusion I had to work through prior to these meetings. In one case, I was feeling hurt and helpless…and I was getting ready to formulate my position on paper so I wouldn’t forget my points. I was going to do that right after I whizzed through my Bible reading for that day. As I was skimming through my reading, I saw the phrase “draw near to God with a sincere heart”. I stopped and immediately softened. I talked to God about it and I told Him how I really felt. I sensed His mercy and love for the situation. And I stopped planning and kept praying for His help in communicating and listening through a heart of sincerity. Many times we approach conflicts or miscommunications as a battle to be fought. But I believe that our deepest longing underneath it all is to be understood. It’s scary to ask that of someone who has hurt us or is angry at us. I’ve heard people say, “well I’m just keeping it real”. What they are really doing is spewing – but without transparency, and with an agenda. Or there’s the person that postures as if they are listening, but uses deflection, blame-shifting, or “spiritual” reasoning to avoid owning their part of the problem. I don’t think we even care about receiving an apology as much as we long for sincerity. It disarms us. It takes the angry breath out of our chest. It brings tears to our eyes. Even love without sincerity means nothing. But our words, spoken through the lens of sincerity can love others well beyond even well-meaning, truthful words. When someone communicates with me through sincerity, their words are received in my heart. And when I choose a path of sincerity, I end up speaking truth, being transparent, and avoiding the tendency to manipulate. Our lives are busy and our days are full. We don’t always have the time to think through how to respond to every encounter we will have that day. We also don’t have the wisdom on our own to navigate through every difficult, even long-term problem with someone. But there is one thing we can do…we can start with sincerity….and see where it leads. Even if the person does not receive our sincerity, we will have a peace because we have been honest in a loving way. And we will not have regrets. Sincerity is the only “real” way to be. It may not lead to complete resolution, but it will lead to restoration – even if that is only for our own heart. Categories: Character, Inspiration, Journey With God, Parenting, Relationships | Tags: Christianity, God, Grace, Heart, Humility, Perseverance, Redemption, Sincerity, Stories | Permalink. I’ve been deeply touched by a book I’m reading about Mother Teresa’s more private life and thoughts. The book contains some of the letters she wrote to her mentors and spiritual advisors who were praying for her as she answered God’s call in founding the Missionaries of Charity. I have to admit – I obtained this book because I wanted to know about the heart of this woman, and how she could possibly love so much. I wanted to know what her method was. But as I read the first chapter I was struck with the answer. She didn’t want anyone to know. Apparently Mother Teresa sent multiple requests for her private letters about her life’s calling to be destroyed because she did not want any credit to go to her…but only to God. As her ministry grew, she began receiving requests to be interviewed about her ministry and how “she” developed it. Instead of granting these interviews, she pleaded through various communications with leaders in her church to destroy her letters and documents. Some complied with her request, and others did not. Here is one of her letters, written 3 years after her original request for the documents to be destroyed. Two years ago a dear older friend and mentor asked me a question that I will never forget. We were emailing back and forth about a wrong perspective I was struggling with. I shared with her in-depth what I was struggling with, my feelings about it, and what I felt like I needed to do to change it. In her response she gracefully empathized but asked me to look back at my email and count how many times I had written the word “I”. I didn’t need to count to see that it was about every other word of my long email! What a gift she gave me. I started thinking about all those “I” statements and I tried to reword them into “He” statements. It gave me a completely new perspective on my situation…as well as a new hope. We like the next new book, counseling program, or real-life story. And truly, those can be wonderful things if we ask God what He has for us through them. I think the danger comes when we look for a method to follow. Why don’t we believe that God has something personal for us? Mother Teresa’s secret was simply being with the Father and saying “yes”. There was nothing magical about her. I’ve also learned that she lived a life of saying yes to God immediately, once she knew it was His will. Some criticized her for that – they said she didn’t think things through enough. Do not be dismayed, for you are your God. Categories: Character, Inspiration, Journey With God | Tags: God, Grace, Isaiah, Missionaries of Charity, Mother Teresa, Religion and Spirituality, Teresa, Writing | Permalink. I’ve been a Christian since childhood….but my friendship with Jesus actually began a few years ago. That is really another story, but as I write that statement, I am faced with the reality that I still long for more. No matter how much I learn, how much more of my heart I give Him – I still never obtain “it” – that elusive fulfillment we claim we can have. I have heard the following types of statements in various Christian settings my whole life: “God will meet all your needs”; “When God closes a door, He opens a window”; “Your identity has to be in God alone”; “How could God allow this to happen”? All of these statements reflect a belief in some Christian communities that when we have a right relationship with God, our lives will be perfect and we will be completely satisfied in Him. Well after a lifetime of doing, planning and striving to be close to Him, maybe I’m alone here…but I still don’t feel satisfied. I still question whether I’m in His will or not. I still think I “hear” Him, and step out only to find a closed door. And I still want more. A year ago I started the process of going back to school for a master’s degree in counseling. I wanted to do it really bad, but after facing the reality of the commitment, I had no choice but to put it on hold. With two small children, it was just not feasible. I was a little disappointed, but felt like it could still happen down the road. A few months later I felt stirred to pursue a ministry activity that I’ve been passionate about for years. I was excited, thinking this is what God had…and that’s why the counseling path didn’t work out. I spent weeks working on the “plan”, but circumstance after circumstance proved the timing was off. That experience has stayed with me. I was still disappointed for a few weeks. But although God said “no” to my plan – instead of a slammed door, I was faced with the intentional nature of His love for me (much more than an open window). His love allowed me to spend my energy embracing the moment before me instead of anxiously trying to figure out what “His will” for my future was. His love gave me a memory I could have altogether missed. Now my red-head is running around and saying words – not the baby he was at the park just two months ago. I still talk to God about the longings I have, and I acknowledge that they are grounded in who He created me to be. At this moment I choose to have hope that what He put in me will be carried “to completion”…as His Word says….and in a way that will blow my socks off. My prayer lately has been, “God help me to want what You want for me”. And in that place I find a quiet trust and a quiet hope. His love compels us not to have regrets later because we missed what was important now. But our continual longing and our inability to be satisfied is also a gift. It points us to Him, with the invitation to receive more than we can ever ask or imagine. I’d rather settle for more than less. And I pray that you, being rooted and established in love, may have power, together with all the Lord’s holy people, to grasp how wide and long and high and deep is the love of Christ, and to know this love that surpasses knowledge—that you may be filled to the measure of all the fullness of God. Now to him who is able to do immeasurably more than all we ask or imagine, according to his power that is at work within us, to him be glory in the church and in Christ Jesus throughout all generations, for ever and ever! Amen. Categories: Inspiration, Journey With God, Parenting | Tags: Christianity, Jesus, Ministry, Religion and Spirituality, Stories | Permalink. My dear friend, Vanessa, lost her Daddy a little over a week ago. Although she’s 38 years old, she still calls him “Daddy”. She found him after he had passed away in his bed early one morning. She and her brother had flown out to be with their dad for a fairly routine heart procedure. They decided to come because of an unsettled feeling they had about him going through it alone. Things went well, and Vanessa’s brother flew home the same night. She stayed with her dad, and was alone when she found him the next morning. Several years ago Vanessa also discovered her mom, after passing away from a sudden heart attack in her bathroom. She was alone then too. My heart has been grieving since I talked to her on that Friday she lost her dad. No words come to mind or can possibly stand up against the devastation of a heart-broken, sobbing person you love. Just when I wanted to say something stupid, like “He is in a better place”, I instead found myself entering her grief and just crying with her. I told her I loved her and I meant it…and we just cried. I’ve since been reminded of why I love Vanessa so much. When I was nine-years-old, she and her family moved in next door to us. Our younger brothers were also close in age and the four of us became good friends. We did all the normal kid stuff and laughed a lot. When we moved to a different neighborhood two years later, Vanessa and I stayed in touch by exchanging letters and attending each other’s birthday parties. When we would start to lose touch, I would receive a surprise letter from Vanessa. As we got older, every year I would receive a home-made, hand-written Christmas card, and Birthday card. Even when I was away at college, she made the effort to find my address and send me a card. In our early 20’s, we lived in the same area and began hanging out a lot. We became close during that “transitional” season of life when you are trying to figure out what to do with your life. We were both working and going to school, and socializing a ton. I still laughed a lot around her….just like when we were kids. And she always had “this friend” or “that friend” that would be joining us. I met a lot of new people through her! About eight years ago, she moved to the Washington D.C. area and although we’ve been miles apart…she still manages to keep in touch with me. She still remembers my birthday and she still sends Christmas cards (though now it’s by email to 100 people at once…she wouldn’t be Vanessa if she didn’t continue to accumulate friends!). She is still my dear friend. And when we got together with our brothers and her boyfriend last night….we laughed again like little kids. It’s so rare to find someone that pursues your friendship like that, and makes you feel special even though it is how they are with everyone. And it’s rare to find someone that cares so much about you, and enters into your world even though they’ve just been through a trauma. At her dad’s funeral I was really moved. One-by-one, folks came up to share about Vanessa’s dad….his golf buddy, his life-long friends, his subordinates, his peers, and his children. Most all of them described the same quality about her dad that meant the most to them – his concern and his availability for people. They would talk to him about their problems. One person never heard him say a bad word about anyone in the twenty years they were friends. Another gentleman shared about receiving a letter from Vanessa’s dad while he was serving in the Army. He hadn’t talked to her dad in years, but somehow her dad tracked down his address and sent him a letter that reached him at just the right time. Vanessa spoke about her dad’s influence in her life, and how she takes after him. She herself finds that as a college professor, students come in, close her office door, and ask to talk to her about various things. She pursues people, and keeps in touch. She contacts them and makes their day when they needed to hear from a friend. She is a loyal friend that never speaks badly of anyone else. She laughs a lot. She is living out the things people loved most about her Daddy in her own life. Her father modeled it for her, and she became a reflection of His life-changing qualities. One older gentleman who shared at the funeral pointed out that her father was the kind of man he was because of his parents. Looking at Vanessa and her extended family, he said “Find out who his parents were”. Those who have gone before us leave a legacy. No one is perfect, but we are wise to examine the qualities that positively impacted the lives around them. And we are wise to follow in their footsteps. In honor of Willie Little, and his reflections – Vanessa and Jason. © Kristin Gordley and Moments In The Story, December 2012. Categories: Inspiration, Relationships | Tags: Family, Greeting card, Grief, Memories, Pain, Stories | Permalink. It’s kind of ironic to think about the role of perfection in how we view the world and each other. I have spent most of my Christian journey focusing on my weaknesses, my sin, and my striving to be a good person (notice how many references to me were just in that one sentence – “I”, “my”). I’m not saying that all Christians do this, but for some reason the way I’m wired is to seek perfection. Even if I never achieve it, the fact that I’m seeking it somehow makes me feel better (a lot of “I’ms – goodness!). So where has God been in this equation? “Well”, says most-of-Christian-life Kristin, “He helps me”. Oh…so he helps you be perfect, you ask? Good question. I don’t know the answer, but I do know that awhile back I saw John 10:10 in which Jesus says, “I have come that they might have life and have it to the full”. Deuteronomy 30:19-20 says, “Now choose life, so that you and your children may live and that you may love the Lord your God, listen to his voice, and hold fast to him. For the Lord is your life”. I think this means that when I choose God, I choose life. He wants me to live life to the fullest, and He wants to do it with me. Umm…laugh at the things I find funny? Sit and watch that movie with me instead of watching me journal memory verses? It’s interesting how as Christians we can be about earning our way into relationship with Him. We are uneasy about the vacuum between our efforts and His acceptance. We don’t believe He could really want us to be happy, to enjoy our lives, to relax. We fill our lives with duty and the Christian walk becomes all about what “I” do, rather than what “He” has done, can do, and will do with my little ole day changing poopy diapers. What if all that agony over trying to figure out what He wants me to do for Him is not Him at all? What if the silence is His way of telling me I’m trying to do religion, and involve Him in something that’s not what He is about. I’m not trying to down-play the importance of reading His Word, trying to get to know Him, and involving Him (um, finally some “Him” words). But to journey with Him means to drive on the road of life in the same car with Him. And He has to help me want to…I can sing for 3 hours, pray for 4, journal for 10…but if it’s about me earning something to feel more perfected, it’s just a waste. I’d rather have 10 minutes in the car with my rowdy boys yelling in the back… but my heart really talking with Him, like you would with a friend over coffee. May you experience Him, laugh with Him, and drive with Him! © Kristin Gordley and Moments In The Story, November 2012. Categories: Inspiration, Journey With God, Parenting | Tags: Christian, Christianity, Evangelism, God, Jesu, Kristin, Lord, Religion and Spirituality | Permalink.